Home Alexa Study Traffic STUDY: Why is my Alexa Traffic Rank Dropping? STUDY: Why is my Alexa Traffic Rank Dropping? Alexa ranking is purely based on traffic on your website. And if you think your website traffic is gradually increasing and still your Alexa ranking is dropping then below are some of the reasons. Well it is very important to have Alexa toolbar installed on all the browsers you use to access your blog. The primary source of data for Alexa ranking is this toolbar. Its very difficult to get a good Alexa ranking just from 1 machine but never the less its better to register some hits rather than none. If your blogs traffic growth is say few hits more each day, it is not necessary that other blogs are also growing at that same pace. It is possible for other blogs to get more traffic and a faster growth than your blog, especially those blogs which are ranked close to yours. Don't worry I will explain. Look at the below diagram. It shows a simple graph. The top tail in green shows websites which are most popular and they are at the top. The bottom tail is long and strong indicating all the low traffic generating websites. Since the tail is very long it indicates that there are millions of websites in that category. So even if there is a few visits drop in your website the impact is really great. Just think of it like an exam where 1 million students have appeared. Students getting 100 on 100 will all be ranked 1st. Say there are 100 such students having 1st rank. If there are 1000 students who got 99 they all will be ranked 1001 after 1st. Think what will happen to website ranking amongst millions of website around the world. 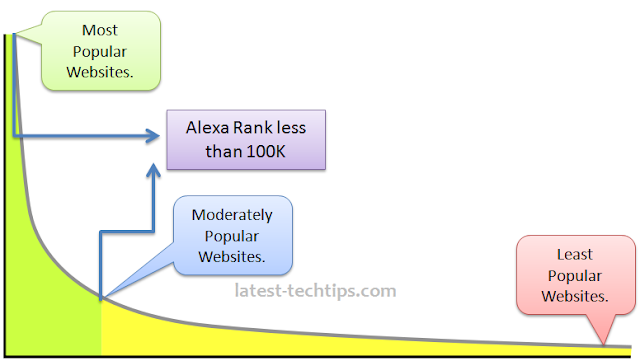 It is said that if your website has an Alexa rank of less than 100000 then you are fairly popular on web rest all fall in the long tail category.